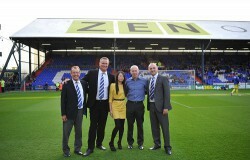 ZenOffice are delighted to announce the extension of their partnership with Oldham Athletic Football Club. ZenOffice have been valued partners of Oldham Athletic for the last 3 seasons and this sponsorship aligns both parties until the end of the 2015/16 season, with Latics receiving a significant five figure sum as part of the deal. Oldham based ZenOffice has grown to be one of the North West’s largest independent office suppliers and have over 40 years’ experience supplying complete office solutions ranging from stationery through to Xerox managed print services, interior fit-out and refurbishments and print and design solutions. Click here for more information on Oldham Athletic Football Club.